When used correctly, data can powerfully enrich sales and marketing efforts and help any business fuel growth. But all too often, companies fall into the trap of using partial or old data to drive major decisions. As the Head of Growth Marketing at Clearbit, and previously a co-founder and CEO of more than a few startups (including WorkMob, ApiXchange, and GoFlow), Matt Sornson knows these pitfalls intimately and how to avoid them. At Clearbit, all marketing falls under growth marketing. In practice, that means an experimentation model is applied to all marketing activity, from content and demand generation all the way down to brand. Companies commonly make the mistake of using expired or partial data from a small subset of users to justify big decisions. Data is constantly changing, and it can be utilized with maximum effectiveness if it’s current and representative of most users. Rather than releasing its books in bulk and gating them, Clearbit released one chapter at a time publicly. This allowed a passionate audience to develop – and built enthusiasm ahead of the books’ full release. PR is an underutilized growth tactic. If you can understand how to structure content in a way that is timely and relevant to journalists’ beats, they’ll not only tell your story, but tell it in the way you want it to be told. Why does Matt see free products as a tool for growth? They allow for massive scale and provide a captive subscriber audience that you can upsell. Adam Risman: Matt, welcome to Inside Intercom. Give us a feel for your career to date: what brought you to Clearbit, and what’s the mission of your team there? Matt Sornson: My career’s been pretty non-linear and unconventional. I started out building websites in high school and then didn’t have much of a college experience and instead got into real estate. From there, I got involved in startups. I started a few companies, one of which we sold. A few years ago I was taking a little break, met Alex MacCaw and joined Clearbit a couple months later. For those not familiar, Clearbit is a data platform around people in companies. We provide data for modern sales and marketing teams across all the products they already use. Adam: Full disclosure: Clearbit has an integration with us that we’ve been extremely happy with, along with a lot of our customers. You joined the company in a growth role in 2015, shortly after the company was founded, right? Matt: Correct. Growth in the early days at Clearbit was a little different. We actually had three engineers and three people that we categorized as growth, which included sales, marketing, customer development, product development and ideation. Everything was combined across the board, so it wasn’t traditionally what you would see in most growth roles at larger companies. We believed that everything we were doing was a test or an experiment, even selling a new use case, for example. Today Clearbit has just over 30 employees. The growth marketing team is four full-time people, and we’ve got about 12 contractors on our team as well. Adam: Put us in the room in those early days. You have a bunch of problems you could tackle on the board, but there are only six of you. What did you go after first and why? Matt: We were building APIs for developers and product people. One of our first products was a Watchlist API, which is for OFAC compliance. Then we built an enrichment API, which is our most popular product today. It takes an email domain name and turns it into 100-plus points of data. We have prospector API, which is about lead generation and finding new contacts. We would launch a new product every couple months. We’d be running through all the initial customer feedback, getting our first users up and going, and then one of the big pieces that happened quickly was the persona development. Originally we built APIs that engineers could use to build and add features to their products. Very quickly, we started getting a ton of interest from sales and marketing professionals who wanted to use it in their CRM and their marketing automation toolbox. They wanted to personalize their website and emails, and we didn’t have products for that; we had APIs. So, that was a huge part of the first year: figuring out how to move in that direction. Adam: That’s an interesting challenge. Where did you start? Matt: We started with a Salesforce integration. Looking back, we got kind of lucky in taking that step because that’s become a really big part of the business. We built a Google Sheets integration, a Gmail integration, and more and more integrations when we figured out where they hit and how people got the most value from them. Adam: Does Growth today cover the whole marketing funnel from top to bottom? Where’s your team working? Adam: So by having the whole marketing team be growth marketing, are you encapsulating the idea that it’s really everyone’s job to grow the company? Matt: It’s everyone’s job to grow the company, but we’re also thinking about things with an experimentation mindset. Instead of saying, “My job is to create a blog post,” it’s, “My job to change X number, and one of my tactics is to create content”. Adam: Data is at the center of all that work. What are some common mistakes you see marketers make when it comes to utilizing their data? Are they ignoring things they could squeeze more from? Matt: One of the big things is not having enough data or allowing yourself to operate with partial data. I see that a lot. People make decisions when they only have data on 10 percent of their users. If they’re a B2B company, it might be a very small number they’re using to make a large decision. Not to pitch Clearbit here, but any data-enrichment vendor helps you make smarter decisions everywhere, whether it’s in emails or segmentation. One of the biggest wins I see is people finding the right data through a vendor or figuring out on their own what signal actually matters and then applying that to every user. On the other side, people often treat data as a static object. If you have a database of 20,000 people or a few million, all that data changes a lot every month. People don’t think about that and make decisions based on data they’ve had for three, four or five years, or even just six months. Because these two mistakes are so closely tied to what Clearbit does, we see people really struggle with those pieces. But once they solve them, they see really cool gains. Adam: We use Intercom to support Intercom, to sell Intercom, etc. Are you doing the same with Clearbit? Matt: We use Clearbit heavily. Enrichment is present across almost everything that we do: our support team uses enrichment in their support tools, our sales team uses it in their sales tools, and the marketing team uses it for communication personalization. Then, Reveal (an IP intelligence product) is used everywhere to identify interest. We use it to trigger chat, to personalize the website, all sorts of things. Adam: How are you incorporating all this data into the qualifying your marketing leads. Where do you start? For us, it really comes down to the technology a company uses as well as their business tag. We stopped using any sort of industry categorization, and we now use a ML-based tagging system that we developed. It looks at the content of the website and puts companies into categories like SaaS, B2B, enterprise, marketplace, etc. For us, if it’s Saas, B2B and using one of six pieces of technology, it’s a super high signal. Of course, job title matters as well. It’s become relatively formulaic now. Adam: When you’re revisiting that on a monthly basis, who’s in that room? Where does the discussion start? Matt: We have a monthly sync to calibrate marketing and sales efforts. The Head of Sales, CRO, Head of Operations and I go through quantity and then previous qualified quantity and see if the pipeline is growing at the expected rate. Then we dig into bad leads. For anything that’s been flagged, we figure out why and make sure we can exclude that going forward. Adam: Growth at Clearbit predates a lot of other functions. What was it like for you as you brought sales and customer success on board? How did you learn to work with those groups? Matt: We were lucky in that we grew the team very slowly for the first three and a half years, and that led us to figure it out somewhat organically. We brought true customer success on a little bit too late. Now that we have a phenomenal success team up and running at full capacity, it’s such a huge burden lifted from the company. Adam: How are you defining customer success in your context? Matt: Customer success is everything after the deal has closed. Once the close happens, there’s a half handoff and customer success essentially takes over on implementation and onboarding. At Clearbit, customer success works with all of our annual customers, and then we have a support team that works with the growth team to have automated support for our self-serve customers. Adam: Content falls under your team’s umbrella. Are you sitting down with sales to talk about what they need to help to close those deals? How are you supporting them? Matt: We do quite a bit of sales collateral work, and some of it is ad hoc. We try to make sure that it’s a little bit more predictable and also that the need lasts. When you have a B2B company that’s not closing thousands of deals a week, you become pretty reactive to the few deals each week that you’re closing or not closing – and if there’s a piece of collateral that feels like it could have helped close one deal, often it’s very loud. We try to space that out a little bit, so the need has to stay true for a few weeks before we commit resources to create a solution for them. Adam: One thing your team has seen success with in the past year is the release of two long-form books: Data-Driven Marketing and Data-Driven Sales. You’ve released these one chapter at a time, put them online and allowed anyone to read them as you built up to a big, grand release. Why take that approach, rather than gating the book from the get-go? 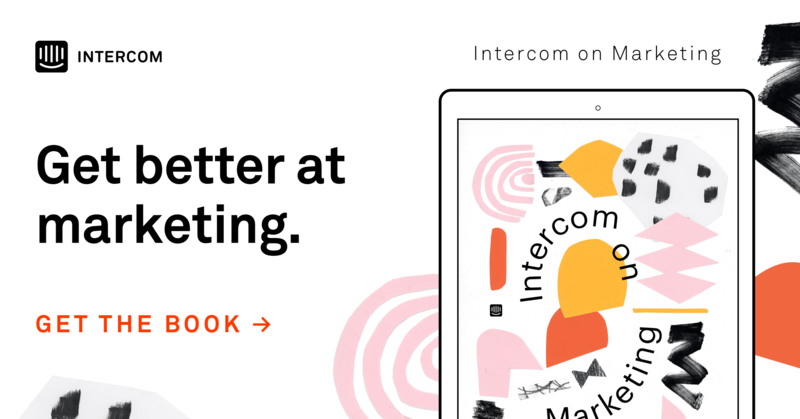 Matt: We were actually very inspired by Intercom’s books. I remember looking at those almost a year and a half ago and thinking, “This is something we want to emulate”. I also love Hack Design, which has a 12-course series that they send out weekly once you sign up. It’s a cool serialization of content, and you have an expert teacher for each lesson. We decided we would try to combine those two ideas and do a serialized book where a subject-matter expert wrote each chapter. The hypothesis was that we could get some of the best minds in the world to give us their knowledge on sales and marketing. Then, we’d have 10 or 12 mini launches before the larger launch, which would build momentum and a larger audience around the name and brand. Adam: You mentioned the use of external contributors there, which include folks from HubSpot, SalesLoft and Engagio. What’s not there are Clearbit bylines. Why go all-in on the outside approach? Matt: Our goal with this project wasn’t to push the Clearbit product or brand, per se. It was just to bring attention to people who were doing really cool stuff with data in sales and marketing. Luckily, a lot of the time they tend to be doing that with Clearbit data, so we get a nice little piece there. Really, it’s about sharing awesome ways people are using data in ways you may not have thought about before. Adam: As you were working on these books, did any chapter surface an ah-ha moment for you? Matt: Two chapters stuck with me the most. One was about automating your outbound sales effort, which was a topic we talk about a ton – but very few customers at that point had been able to do it end to end. Internally, we call it “the reveal loop”: it’s using an IP intelligence product to take an IP address, map that to a company, and then send automated outbound email to the likely buyers at that company. Essentially, it’s re-targeting with email. It only works for certain B2B verticals, but it’s really interesting and was fun for us to look at the success some people had with it. The other chapter was in Data-Driven Marketing. It focuses on data-driven PR and how to structure content so that it helps journalists tell stories and eventually gets them to tell the ones you want them to. There aren’t many companies that have taken that approach, but it’s really cool. Adam: We recently talked to Gina Gotthilf (who used to lead growth at Duolingo), and she mentioned that one of the most underrated growth tactics is simply being good at PR – particularly in the early days. Matt: It’s funny because PR is something that we have put very little effort into, but reading that chapter made me really re-evaluate. It’s changed some plans. Adam: What did you learn about the difficulties of working with a wide range of brands and thinkers as contributors? It got significantly tighter, and we were able to do a six-week production on each chapter, whereas it took much longer in the beginning. We hired a managing editor for each book, and they were invaluable. They made sure every chapter came out in a similar voice so it was a consistent reading experience. Adam: How are you measuring both the performance or ROI of a content project of this scale? Influenced revenue, which is anyone who was already in a sales cycle but then read a chapter or saw some of that content. Of course, we did look at some higher funnel metrics to determine which chapters were performing: things like completion rates, sharing, and views. That told us which chapters we should spend effort promoting versus which ones drove revenue. Adam: If you were to embark on a third book, what would you do differently? Matt: In terms of promotion, we would make it a tiny bit more formulaic. Promotion is two thirds of this. You spend all this time writing a book that’s full of great content, and then you have to figure out how to automatically promote stuff. One really cool thing about having the guest authors is that their companies or firms will often help in that promotional effort. Even giving people a bunch of pre-created assets, blurbs or tweets – every single thing you do for them increases the amount that they will help you promote. It sounds very logical, but it takes a while to get there sometimes. Adam: Do you think creating a canonical story around this particular topic is a tactic that works for any type of SaaS company, or are there other companies where it’s not the best type of content to grow their business? Matt: It may not be the right type for many companies. It’s incredibly labor intensive. What it produces is very cool, and we’re very excited to have done it. But, we also are in the mid to upper end of the B2B SaaS market, and that allows us to spend quite a bit on something like this. Other products might be different. I think we were lucky. We got amazing contributors, and the editors were phenomenal, but I don’t think this is a tactic for everyone. Adam: We’ve got a lightning round of growth-related questions we’ve been asking our guests this spring. To start, what’s your favorite, underused growth tactic? Matt: Free products. You can have massive scale and you can drive paid acquisition to a free product, which then gives you a captive subscriber audience that you can upsell to for the next nine months for free. Adam: One book that’s most influenced your thinking and why? Matt: On Writing Well by William Zinsser. It’s really impacted how I communicate, especially with my team, which has changed how I think. When you write better, you think better. Adam: Your favorite recent onboarding experience? Matt: I have two: The first is BackCountry.com, which I hadn’t used in forever. I bought some ski gear there this winter, and it has a really nice email flow post-purchase, and they have customer success too. People reach out to talk about gear with you, which is super unusual for a clothing company. In the B2B world it’s Appcues, which is an onboarding personalization tool that does a really nice job of blending your success rep with automated messages. Adam: Who in the growth community do you look up to or think we have the most to learn from? Matt: In the SaaS B2B world, we still learn most of it from B2C – we’re a couple of years late. Anna Hongo over at Musical.ly does some really cool stuff. I don’t fully understand Musical.ly, but it works insanely well and people are so addicted to it. Yuriy Timen over at Grammarly is also really smart. Adam: Messengers: Are they a game changing new channel for growth? Is it too early to say? Matt: Yes and no. I think that chatbots are interesting, along with site personalization and IP intelligence. They all fall into the same category for me, which is trying to engage people earlier. People typically know everything about your product by the time they talk to sales – or at least they think they know everything. The sooner you can engage them higher up the funnel, the higher conversion rate you should have. Adam: What’s a common mistake that you see growth teams make when it comes to running experiments? Matt: I think this happens to us occasionally, which is why it’s top of mind: overcommitting to an experiment and not re-calibrating. You want to be true, so you keep working it and working it two or three times longer than you should.